Mom should have been born Jewish. She loves the food, the culture, and the people. We watch The Gefilte Fish Chronicles on a regular basis and we eat a lot of bagels with cream cheese. After spotting a sale at Stop & Shop on a few Jewish products, she decided to buy them and showcase them here for all of our Hebrew fans. God knows we must have gained a few after my interesting lox and whitefish salad experiment. By the way, my mouth is still dried out from all the salt in that meal. 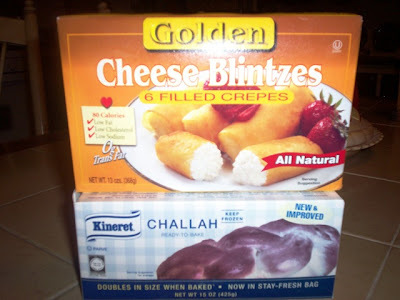 We purchased a ready to bake Challah bread by Kineret (made for holiday and Sabbath meals) and a box of cheese blintzes by Golden that we were supposed to have with dinner on Tuesday night. Due to circumstances beyond our control, we ended up having them with dinner on Wednesday night. 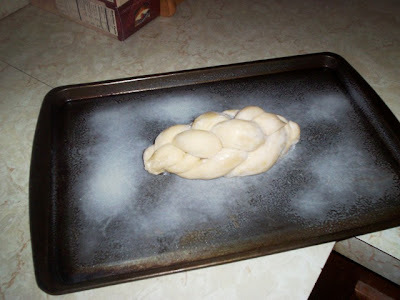 After taking the braided, frozen Challah bread out of the box and stay-fresh bag, we were required to put it on a greased baking sheet complete with rusted spots from years of use. Next, we sprayed a tea towel with non-stick cooking spray and placed it over the bread. We were to leave the covered bread on our kitchen counter for four to six hours so that the bread could double in size. This was at 1:30 p.m. on Tuesday. Cut to 5:30 p.m. when we checked the bread and found that it barely grew and was still very frozen. We checked again at 7:30 p.m., which was the sixth and maximum hour to leave it out, but Mom knew that the bread still had a long way to go. I guess we have a really cold freezer! By 9:30 p.m., Mom was confident enough that the bread had doubled in size and had been completely thawed out, but dinner had come and gone hours ago. 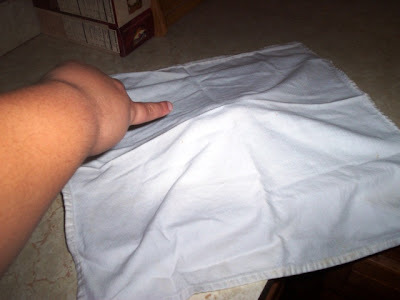 She decided to cover the bread, towel, and baking sheet in foil and put it in the refrigerator for tomorrow night's meal. 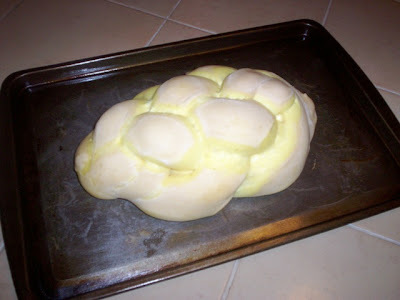 By Wednesday evening, the bread was looking fabulous. 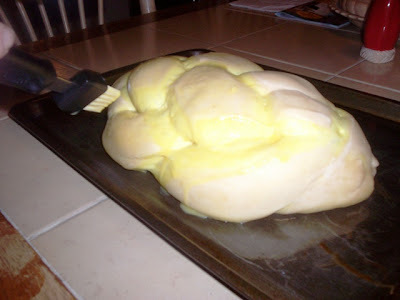 Before Mom placed it in the oven, she gave it an egg wash bath. THE VERDICT: Mazel tov! The bread was just as tasty as it was beautiful to look at. It had a thin, crisp crust with a really moist center and a beautiful yellow color to it. 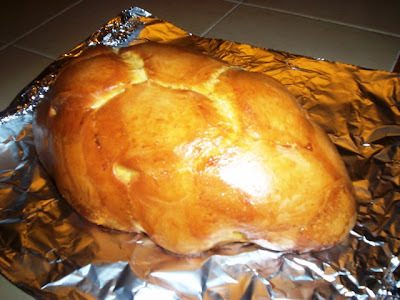 The taste was on the sweet side, almost like a Portuguese massa (sweet bread). Mom, Dad, and I inhaled it and left no crumbs behind. Since it is on sale again this week, Mom was thinking about buying it again. I am DEFINITELY all for it. We just have to remember to start preparing the bread a day in advance. 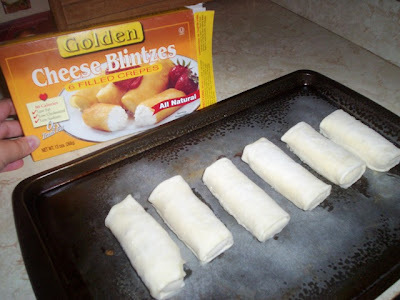 As for the cheese blintzes, they only took 20 minutes in the oven. 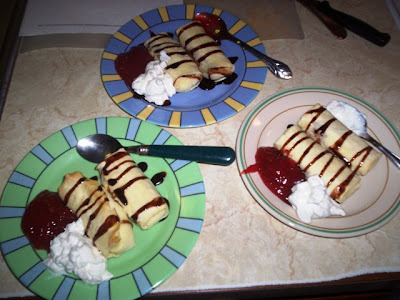 We placed them all on another greased baking sheet and when they were done, Mom got all fancy and decked them out with the requisite strawberry jam and sour cream. She even added a chocolate swirl. THE VERDICT: Great! When they baked, the crust became lightly crisp without getting too hard (like a cannoli shell). The cheese that was stuffed inside each shell was creamy and flavorful. It was a lovely dessert that we all enjoyed. All in all, our Jewish products were a success! Yes, the bread was temperamental, but the taste of it was fabulous and the cheese blintzes left me wanting to buy the other flavors on our next trip to the market.